Save Paradise Island in the latest Wonder Woman slot with a Playtech No Deposit bonus, complete with 3 in-game features, 3 free spins features, and more. You've been invited by Playtech to join an intense battle between the powerful Cheetah and the almighty Wonder Woman. The end result of this incredible battle will determine the fate of Themyscira, an archipelagic island and unitary sovereign city-state appearing in DC comic books. Previously known as the Amazon Isles or Paradise Island, players will need to use the powers of Wonder Woman to save the day from the formidable Cheetah! 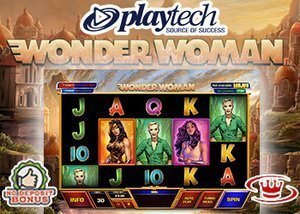 The new Wonder Woman slot from Playtech is magnificently portrayed across 5 reels with 4 rows and features 30 non-adjustable paylines. Players will also be able to experience some of the most rewarding bonus features ever created while using a Playtech no deposit bonus, including wilds and scatter symbols, re-spins, transforming symbols, fire wild free spins, cheetah free spins, Wonder Women free spins, and 4 progressive jackpots along with a top jackpot prize worth 150 times your total bet size in the base game. The Wonder Woman logo, portrayed in sterling silver, will represent the wild icon on the reel set, standing in for all other symbols to form a winning combination. However, the Wonder Woman wild logo will not stand in for the scatter symbol. The icon depicting both the Cheetah and Wonder Woman will represent the scatter icon on the reel set and you will need to land the scatter icon on reels 1 and 5 to trigger one of three free spin features, including the Cheetah Free Spins feature, the Wonder Woman free spins feature, and the Fire Wild free spins feature. The Cheetah Free Spins feature will award you with 12 free games and all high-valued symbols that form part of a winning combination will transform into Cheetah symbols that will remain in place for the duration of the free spin feature. You will also be able to receive 3 additional free spins when 1 scatter symbol fully appears during the free spin feature and 12 additional free spins when 2 scatter symbols fully appear on the reels. The Wonder Woman Free Spins feature will award you with 12 free spins and one of six symbols will appear stacked on each of the 5 reels. You will also have the opportunity to unlock 3 or 12 free spins when 1 or 2 scatter symbols fully appear during the free spins round. The Fire Wild Free Spins feature will award you with 12 free spins and the Fire Wild symbol will make an appearance on reel 3. When it is displayed, it will transform into a high-valued symbol and change all instances of that high-valued symbol into wild symbols. Landing 2 Fire Wild icons will transform 2 high valued symbols, while 3 Fire Wild icons will transform 3 high-valued symbols. You can also receive 3 or 12 additional free spins when 1 or 2 scatter icons fully appear during the free spins feature. The new Wonder Woman slot also comes equipped with a Wonder Woman Re-Spin feature which can be activated when a Wonder Woman symbol appears on reels 1 and 5, simultaneously. All Wonder Woman symbols will lock into place while the remaining symbol spaces become empty. A re-spin will then be awarded and you will need to land additional Wonder Woman symbols for the re-spin feature to continue. The Re-Spin feature will only end once there are no new Wonder Woman symbols displayed or when all 20 positions are filled with Wonder Woman symbols, providing a hefty payout of 1,000 times your total bet size. The game further impresses with a Cheetah feature that can be triggered when you land a Barbara Ann symbol on reels 1 and 5. When this feature is activated, all high-valued symbols will transform into Cheetah symbols to provide a truly remarkable payout. The slot also offers a Fire Wild feature that can be activated when you land a Fire Wild symbol on reel 3. Once triggered, the Fire Wild symbol will change into a high-valued symbol and will transform all instances of that high-valued symbol into wild symbols for a single spin. Lastly, the new Wonder Woman slot also boasts with 4 progressive jackpots that can be triggered at random, giving you the opportunity to unlock a life-changing jackpot while saving Paradise Island. Apart from the extraordinary selection of bonus features, you will also be presented with a fantastic variety of theme-related symbols that have all been taken from the DC comic books. This includes the Cheetah, paying the highest base game jackpot worth 150 times your total bet size, along with Ares, Wonder Woman, Diana, Barbara, and a blonde male wearing a blue shirt. You can even form winning combinations with red Aces, yellow Kings, purple Queens, green Jacks, and blue 10's. The new Wonder Woman slot also presents a marvellous selection of betting options to appeal to both high roller and newcomer alike. You'll be able to set the reels in motion from only $0.15 a spin or a maximum of $300.00 a spin. There are 19 different betting options embedded in the slot, making up for the fact that it comes with 30 non-adjustable paylines. The new Wonder Woman slot from Playtech boasts a 95.51% payout ratio. You are more than welcome to get your no deposit bonus at Vegas Red Casino, awarding you with a $10 No deposit bonus along with a 100% welcome bonus up to a maximum of $200 on your initial deposit.